DeansCards.com recently finished organizing all of our Sporting News issues and we decided to write about our favorite weekly sports newspaper in three different parts. The Sporting News can be divided into three distinct periods: Black & White, Color, and modern magazine. This article will focus on the Black & White issues that are some of the most interesting baseball publications ever printed. The Sporting News magazine was founded in 1886 by Alfred H. Spink, a former newspaper reporter and the current director of the St. Louis Browns. At the time the Sporting News was first being printed, the Browns were experiencing some of the greatest success in the history of the franchise. The Browns won the World Series in 1886, inspiring Spink to publish a weekly newspaper devoted to baseball. The early Sporting News editions measure 17-5/16” by 11-5/16” and cost five cents per issue. In 1899, Spink handed his publication over to his brother Charles and eventually phased himself out of the operation entirely. Charles continued the emphasis on baseball, particularly on box scores. Before the Sporting News, baseball box scores were hard to find, especially for baseball fans that did not leave near their favorite teams. Circulation remained low for The Sporting News during the early part of the 20th century, possibly due to unflattering events such as the Black Sox scandal. Fortunately for the Sporting News, baseball’s golden age sparked a new interest in the sport and circulation peaked. The black and white Sporting News layout is consistent with the daily newspapers of the time. Under Taylor Spink’s direction, the Sporting News relied heavily on caricatures and catchy headlines. Many of the covers of the early Sporting News issues look somewhat juvenile due to the cartoons on the front. However, the articles inside the Sporting News were serious journalistic analyses, box scores, and opinion pieces. The Sporting News was one of the most important sources for baseball news all over the United States. 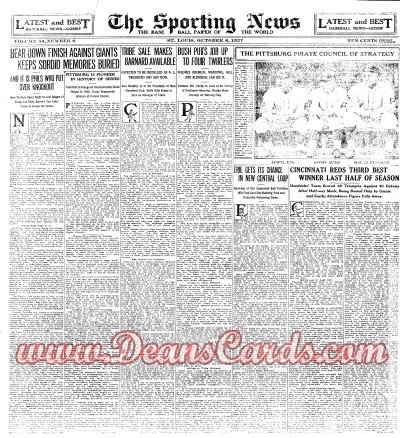 In terms of sales, DeansCards.com has compiled information since we started selling old issues of The Sporting News several years ago. The earliest issue that we have had was the August 30, 1902 publication that featured Hughie Hearne on the cover. Hearne was a mediocre catcher for the Brooklyn Superbas. His major league career spanned only two years, but somehow earned himself a spot on a cover. 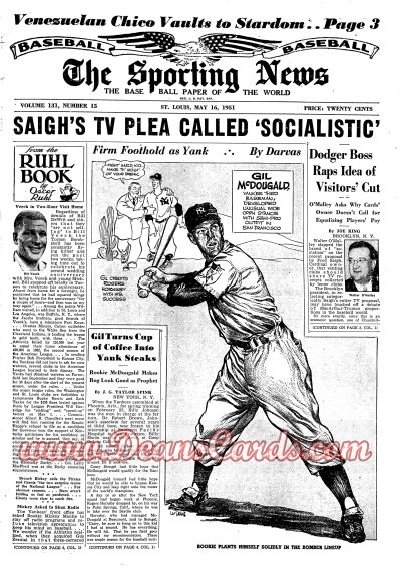 The most expensive Sporting News currently in stock on our site is the October 6, 1927 issue. Babe Ruth’s 60th home run is one of the lead stories, while the Pirates team is the photograph on the front. The Sporting News has been around for 124 years. It has been around for some of the most significant events in the baseball world. It serves as an important relic of the baseball memorabilia world and continues to provide new and interesting information. 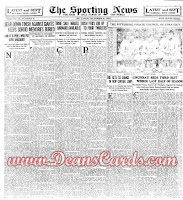 DeansCards.com has hundreds of The Sporting News issues online and ready to buy.